Our group classes are £12 for beginner class, £16 for intermediate class and £20 for 2 classes (taken on the same day), including up to 3 hours of social dancing. We have an Online Exclusive Offer for your first group class. Larger discounts are also available with our pre-paid group class packages. You can also call us at (+44) 20 3560 0532 for information about our classes and packages. Take advantage of our Online Exclusive Offer for your first class. Welcome to Tanguito! It is your first group class. You only pay £10. We know you are busy tangoing bees, so we’ve kept our group class packages very flexible. 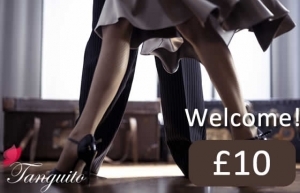 Beginner & improver classes are 60 minutes and are all followed by a practica or milonga (in Angel) so that you can practice what you’ve learned. Pre-pay for 7 group classes. Your 8th group class in on us. Pre-pay for 15 group classes. Get 1 hour of free private class. 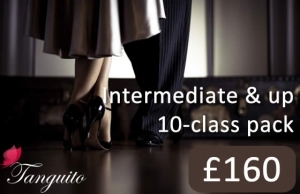 Our intermediate group classes are 90 minutes and give you access to up to 3 hours of practica or milonga social dancing. Great to practice what you’ve just learned. Pre-pay for 10 group classes. Get 1 hour of free private class. You are an intermediate but would like to attend every class, beginner & intermediate to get more chance to practice or to review some of the fundamental technique (always a good idea!). Our unlimited passes are exactly what you need. Take as many group lessons, any day for 30 days! Take as many group lessons, any day for 90 days!